The first meeting in the new office of (neighborhood center) Wijkcentrum d’Oude Stadt hosted a debate on “understanding financialisation”. Rodrigo Fernandez explained what financialisation is, how it works in relation to the housing market, and why it threatens public control of a bsci human right. Rodrigo Fernandez is a financial geographer who works for SOMO, and is also part of the research group REFCOM that works on the financialisation of real estate at the University of Leuven. REFCOM stands for Real Estate Financial Complex, with a nod to the Military Industrial Complex that US President Eisenhower warned about. Rodrigo illustrated his story with a powerpoint, which can be viewed here in pdf. (The report of the lecture by Rodrigo Fernandez below, is not a literal translation but a summary by the reporter). Rodrigo started by explaining how there is a trend that everything becomes part of the market, and subject to price mechanisms, with the result that market logic and market laws apply and public goods become products. This is generally referred to as ‘commodification’. Financialisation is actually a specific type of this commodification, where the entire real economy no longer matters because you can make money easier and more profitably with financial activities than with trading in the real economy. This is also seen as the growing influence of players such as banks and other financial institutions. You can see a clear economic model of financialisation that came into existence in the 1980s, where it is characteristic that wages lag behind and that there is then a growing share of debts to sustain human consumption. Debts and financialisation are therefore closely linked. The financialised economy has replaced the Keynesian model, with full employment and corresponding wages. It has many more aspects for companies, governments and citizens, but this lecture focuses primarily on housing. In addition to the specific economic model, there are also specific parts and objects that are becoming financialised. See many studies on financialisation of universities, housing associations, municipalities, all kinds of services and other parts of society that were initially public goods. They were not only privatised, but subsequently also made part of a debt economy and thus financialised. This happened at the University of Amsterdam, or other educational institutions, where all real estate was transferred to the institutions themselves. the same applies to hospitals, fire stations and police stations, state forest management, asylum seekers’ centers, et cetera. By transferring them to the organisations themselves without giving them sufficient financial resources to properly handle maintenance and renovations, they were forced to deal with them and incur debts. Buildings have a life cycle, at the end there are large costs. As a public institutions, if you cannot afford the upkeep due to the retreating government, you are forced to go to the banks to borrow money, or otherwise to sell your property. This is what happened at a massive scale in Europe. The banks approached with borrowing requests will do so but will set a number of specific conditions. This is the moment that financialisation starts. At the University of Amsterdam, you saw all kinds of processes change, with the institution actually internalising the logic of the bankers and setting up all kinds of control processes imposed by banks, with a wide range of changes taking place. This development was common in all kinds of public institutions. The housing market is again a specific case. Financialisation as a concept among social scientists does not begin to emerge until around the year 2000. But it follows a discussion from 100 years ago, just before the 1st World War. Then it had to do with similar processes, see Hilferding and Lenin, who again mixed it with the concept of Imperialism. They recognised that the old notion of industrial capitalism was no longer enough to understand the economy and that the dominance of banks and the financial sector had since emerged. There have been several such periods, it is a historical phase, not unique, but with its own characteristics at this moment. Historian Fernand Braudel, for example, has analysed how these changes have occurred over the past 500 years and that there are cycles of rising and falling accumulation systems. He describes the shift from northern Italian city states to the Low Countries and Amsterdam, and then to London and then New York, which is the system we are currently in. Every shift is always accompanied by a process of financialisation. Economic historians also call this the fall of a certain period. Everything then becomes financial, liquid, mobile and can then easily be moved to the next location. For example, a lot of financial resources went from Amsterdam to London and from London the financial economy of the United States emerged. An important characteristic of the financialisation of the housing market that is currently taking place is that the logic of the financial market is internalised by the housing sector. In practice, this means that people who have bought their own home, and thus often burdened themselves with high debts, adopt a certain logic of the free market with all its consequences. Regarding financialisation and the housing market, there are three areas that are viewed by people who study the subject. 2) The role of the super-rich upper layer and how they are using cities in the world. They choose specific locations, you see the emergence of alpha locations being created, the playing fields of billionaires and their children. Cities such as London, New York, Miami, Vancouver have become such specific cities. It is about people who have many houses, you get a kind of hyper-gentrification. Even the original local richer upper layer is then driven out of the neighborhood. The houses are then hardly used, if at all. This is also starting to happen to Amsterdam, which has certain desirable characteristics for a global elite, and for the super-rich real estate here is very cheap. Employees or bankers working in London, for instance, are already starting to live in or around Amsterdam and fly to London daily. 3) What you have already seen emerging in Germany and Spain and is now starting to become visible in the Netherlands, entirely according to the plan of the liberal Dutch parties such as VVD, is the so-called ‘commercial real estate’. Hereby investors, institutional investors such as pension funds but preferably foreign investors are attracted to invest in commercial rental properties. This is a specific form of financialisation and involves commercial real estate. Already common for shops and business parks, this buying up of housing complexes is now also applied to residential buildings. (this issue is discussed in more depth in the debate that followed with the audience, where reference is made to the report on Buy to Let, which Rodrigo wrote together with Cody Hochstenbach for the Socialist Party and that can be found here as a pdf. The Netherlands has not been that popular internationally for this type of financialisation. Although there are already many dramatic examples to be found, it has not yet reached the scale of Germany and Spain. But this can change quickly, as it did in these countries, for major consequences for rental properties. The research group in Leuven was termed Real Estate Financial Complex in reference to the Military Industrial Complex, which pointed to the political shared interest between the arms industry, defense and politics in order to maximise their own production. Similar processes can also be seen around the construction and trading of houses and financial intermediaries, the entire system of housing, real estate and financial markets, and you see that different countries have increasingly started to reform in the same way over the last 30 years. Many PhD students have been working on research in Leuven and have investigated specific countries and markets around the world. It is interesting to put the data from the different countries next to each other and then to see what is common or different. What you see is that there is growing dominance of an economic model based on the value of houses and the associated mortgages. From the end of the 1990s, household consumption is increasingly linked to increasing prices of houses. If you had bought a house for say 300.000 Euro and it rises 10 percent in value in a year, you have gained 30,000 euros. People don’t usually save that, but the most important thing is that financial players pick up on it, they will come up with products to redeem your surplus value, in whatever form; a reverse mortgage or because you can get much cheaper credit, so then you can use your surplus value to rebuild your kitchen. This will then become an important part of the economic growth model of the Netherlands. The most important thing is that it is an economic model based on debt. (there is a discussion about the falling value of money, and how the value of real estate is determined. This is done via the market and determined by “whatever any fool wants to pay for it”). Rodrigo points out that a crash occurred in the 1970s and the prices of houses fell sharply. Until 1980, society was still largely such that when women got married they stopped working and did the housework. In that time you could also buy a house on a (mortgage on one single) income. But nowadays you need two or even three incomes to buy a house. The houses have not improved or become larger, but because people have been able to borrow more, prices have risen accordingly. “whatever any fool wants to pay for it” is therefore the mirror of what another “fool” wants to lends for it. The Dutch mortgage interest deduction – a fiscal subsidy for home owners which is cited by someone in the public as a cause – plays a role in this, but has been around for much longer. Why did the debt-driven model not start until the 1990s? Due to a combination of factors. This also concerns provisions such as the “loan to value ratio” (how much you can borrow in relation to the value of the house) which is absurdly high in the Netherlands compared to other countries and was above 100 percent for a long time. In other countries, 60 percent is often the norm. The loan in relation to income is also an important measure. In its entirety, what matters is how the financial sector, together with regulators (politicians and political parties), ensured that monthly payments remained relatively low, while the total amount of debt could rise. And because the latter could rise, the price of housing rose. That is what makes the debt-driven process. It is therefore a model based on debt. These debts make people feel richer than they are and start spending more money, so the economy “grows”. Another important aspect is that you can also see mortgages from the perspective of the banks and the investors; then it is a way to do something with your money, to save. For example, institutional investors need ways and places to put their money away. Real estate is ideal for this. Not just one single home, and a single mortgage, but the entire market, and how you organise such a mortgage market. Individual mortgages are not interesting, but to bundle them, and securitise them, is. By bundling they can standardise them and make them comparable, and make it a unit product, then it becomes an ideal investment product. Money then flows easily from the financial markets into the mortgage market. From the perspective of the financial markets, the housing market is therefore an ideal investment opportunity. This causes pressure on their side to sell as many mortgages as possible. They therefore have an interest in putting as much debt as possible in the system. Rodrigo explains how the subprime was a specific category of targeted people who could get very risky mortgages. The fact that the Netherlands and Europe, where securitisation is just as well applied, did not go wrong in the way that happened in the US does not mean that it cannot happen. A large part of the mortgage debt in the Netherlands is financed through securitisation. But it is indeed important to look at how that is shaped in every country. You have relatively safe forms of securitisation in the Netherlands. And unlike, for example, in Spain and Ireland, there has been less aggressive searching and pushing from the banks. The disadvantage of the more stable situation in the Netherlands, and also in Denmark, is that the total amount of debt has risen steadily. In the US, mortgages were sold while they knew they would never be paid back, but by that time the mortgage would already have been resold to others. Very aggressive brokers played an important role in Spain and Ireland. Banks try to sell as much as possible with the highest possible income, that is the case everywhere. Most importantly, this model leads to households being connected to the global capital market through, among other things, securitisation. This is an important new feature of the financialisation of mortgages. It also means that interest rates are set on global capital markets and through activities far away from what normally happens on the local housing market. This process and model is very addictive politically. It is a non-sustainable political system that has been in place since the 1980s: the share of wages is steadily declining, that of capital owners and their taxes too, economic growth is largely due to debts, and real estate is used to make those debts possible. You can thus achieve economic growth without doing anything about the underlying problem of low wages and the contribution of companies. As long as the house prices rise, it all seems to go well and everyone is happy. Of course not so much for the people who don’t have a house yet, or who are being driven out, they are all on the losing end. The underlying mechanisms of this problem remain unscrutinised: the mainstream media typically reports a rise in house prices as a positive economic development, and presented as something everyone benefits from. It is important to realise that all this is not a natural phenomenon but a political process driven by ideology and made through policies, another issue that remains underreported. The model sounds fantastic and is great as long as you can participate in it. We have moved from a situation where you needed one job per house, to one where you need three jobs to own or afford a house, and there is no way to exit this development. There is no way that housing prices can fall again without being a disaster for large groups of people. Not only is this problem being ignored, but there are not even examples of solutions elsewhere how to return to an economic model based on wages and strengthening rental properties, as part of the rights of a welfare state. (Here follows a discussion about the consequences of a collapse in house prices, and how home ownership has developed in such a way that a majority has become dependent on the commercial housing market). Rodrigo describes how the collapse of prices of housing can have a lot of consequences, both positive and negative, but can also have a very disruptive effect, for politicians, banks, financial players, etc. There is simply no plan, no clear path how to get out of this reality. There is, however, a trend towards municipalisation, and in Germany in some cities a start is being made to try to bring homes back into collective ownership. But the difficult thing is that housing and financialisation are mainly achieved on a national scale and should also be reversed there. Rodrigo concludes by showing a number of illustrative graphs that indicate the situation in the Netherlands compared to other countries. The first slide shows private debt (not the financial sector) as part of GDP, and then you see the shift from 2000 to 2010. 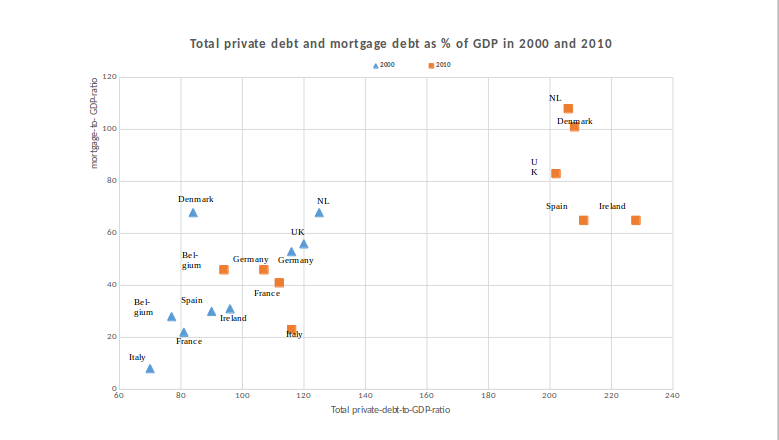 For the Netherlands, the share of mortgage debt in the private debt is very high. That is very different in other countries, for example in developing countries there are relatively much fewer mortgage debts and other types of private debts are much larger. But in 2000, the Netherlands was already at the top in Europe in terms of GDP, at around 70 percent. Ten years later it has almost doubled, and the Netherlands and Denmark are still at the top of the list and are above 100 percent. Countries such as Germany and France have almost stayed in place and therefore have not shot up … (there is some discussion about the differences between the countries, for example Italy that has almost no private mortgage debts, people do own houses there but are free of mortgages). The second graph shows the change in mortgages relative to GDP (between 2000 and 2010). There too you see the Netherlands sticking out with forty percent. Germany is even negative, meaning that the share of mortgages in GDP has decreased during that period. The other axis of the graph shows the prices of average owner-occupied properties compared to the income (price to income ratio). It is clear that the countries where prices have increased the most are also the countries where the debts are highest (Denmark, UK, the Netherlands and Ireland). the figures only run until 2010, but it has certainly not improved in the last 9 years. So you see the prices in relation to income and debt level. The debt level has remained more or less the same, prices have fallen for a short period (during the crisis) and then continue to rise again. The most important thing is that simple mechanism that the more an economy takes on mortgage debt, that also goes together with an increase in prices (relative to income). That is actually the most important thing for the affordability of homes. The last graph: we must not forget that Spain and Ireland are very different. When it comes to debts, they are very similar to the Netherlands and Denmark. But if you look at what it looks like “on the ground,” it has been a completely different housing bubble, namely in Spain and Ireland the number of homes was increasing; in the case of Spain, the entire coastline is built-up. In Ireland it was still about real homes for people, not about 2nd or 3rd houses for rich expats in beautiful places where you will build airports. But what you see here is “construction”, the construction sector as a percentage of the total labour market. What you see is that in the period that there really was a “boom” in Spain and Ireland, the construction sector there was more than twice as large as in other developed economies. The construction sector was really a sector that fueled the economy. The flywheel effect is then much stronger than if you only have a debt-driven model based on mortgages from existing homes. You create a flywheel effect with that for more spending, but that effect becomes much stronger if it also leads to you putting more people to work in that sector. In the case of Spain, it has also led to an enormous influx of people from outside Spain to work in that sector. That can really only be compared with what happened in China. That is of a different order than what happened in the Netherlands and Denmark, where the construction sector is relatively small, when it comes to employment and where it is mainly about pumping debts into existing homes. This is important in connection with the discussion we now have about ‘building building building’ as a solution for the housing crisis, as if that would be the only solution. If you do “build, build build,” then you can also get this effect. With this, Rodrigo Fernandez concludes his presentation. Discussions and additions followed, including the effect of the ECB’s Quantitative Easing, which reduced interest rates and encouraged the purchase of housing by large investors. On the other hand, Rodrigo replies, the interest rate has been falling for thirty years. It has certainly increased the affordability of more debt, but is not the only factor. Furthermore, a great deal of information was exchanged by those present about typical housing market developments in their own neighborhood, such as the sale of rental homes that are subsequently no longer inhabited because the objective is speculation. More about that in later episodes of the “understanding financialisation” series.